In Fresno, California, one in every three kindergarteners speaks a language other than English at home. 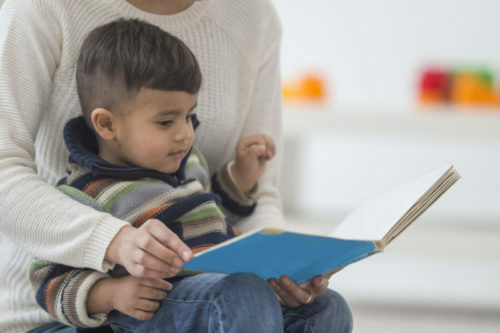 Recognizing a serious need to support children’s language development, educators in Fresno are taking an “it takes a village” approach to support English language learning, home language, and culture before children start school. 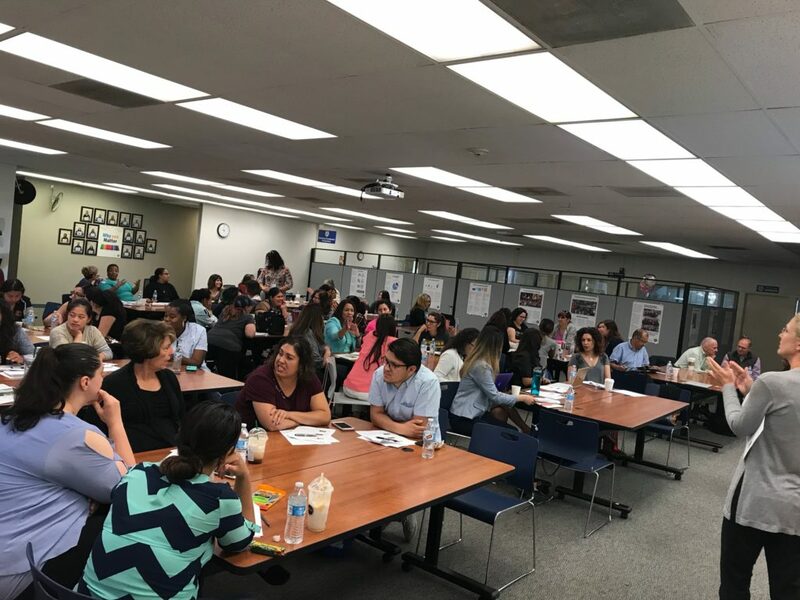 Fresno Unified, Head Start, Early Head Start, Central Valley Children Services Network, and the Fresno County Office of Education are spearheading the Fresno Language Project (FLP). The effort began in 2015 as part of the 10-year Starting Smart and Strong initiative supported by the David and Lucile Packard Foundation. Through collaborative professional learning focused on proven teaching strategies in language learning, the project is creating a close network of both formal and informal early childhood professionals and building capacity across the community. The project is an all-in effort. Fresno’s executive leadership, coaches, teachers, in-home providers, and teaching assistants all meet to learn strategies together. In the early childhood field, it’s rare to find multiple agencies and professionals from every level coming together to lift up all children. Right now, the project touches 19 “classrooms” in the area. In the early stages of the project, the Early Learning Lab helped to identify the focus of the professional learning model and provide content support. We wanted to catch up with the Fresno community and share their work. This month, we spoke with Deanna Mathies, director of early learning at Fresno Unified, and Maria Ceballos Tapia, manager of Starting Smart & Strong in Fresno. How would you describe Fresno’s professional learning model and how it supports dual language learners? Deanna: Our model is focused around learning and implementing the Personalized Oral Language(s) Learning (POLL) Strategies. It’s about the intentional use of language building strategies and it gives teachers concrete ways to support English language development and ensure sure that children retain their home language and their culture, because language is culture. Teachers are often told they should scaffold language, but they aren’t actually trained how to do it. And, I can’t say it enough, amazing new learning communities have emerged out of this at the practitioner level, the manager level, and the executive team level. That really does sound amazing. What’s the professional learning journey like for the teachers? Deanna: Five times a year, teachers attend a Saturday session with a cohort of teachers, some from their agency but also alongside all the other agencies. They go through the professional development session and then we have a coach, Anna, who follows up after each session and goes out to the centers and works the participants. She has a conversation with the teacher around what is it they are doing well and what they want skills they want to develop, using a “How’s it Going” coaching form created by you, Chris [the Early Learning Lab’s director of early childhood practice and innovation]. Maria: After the professional development, the teachers also receive support in the classroom, and the coach does two observations and one-on-one coaching sessions. Deanna: And it’s not the coach telling the teacher what they need to do or what they need to implement, it’s really coming from the teacher after listening to a learning session then they decide, “Oh this is something I really need to work on,” and they identify what POLL strategy they want to develop, and then the coach goes in and supports them and collects data. What were some of the first steps teachers made to connect with families, language, and culture? Deanna: The teachers conducted a Family Languages and Interest Survey, which really was a pathway to building relationships with parents. Some parents had never been asked, “What are your hopes and dreams for your child?” This conversation honors the role of the parent, and opens the door to the parent and the teacher working together on behalf of the child. We haven’t seen many professional learning communities like Fresno’s. What are some of the most innovative aspects of the Fresno Language Project? Deanna: We have a space to learn together around dual language learning, which is so important to children and families in our community. It really has the potential to be life changing. We started with surfacing myths around dual language learners. To me that that was innovative, because we don’t go to many trainings where you really check your own bias or belief system at the door. We’re also bringing a mixed delivery system to learn together and about each other. We’ve built a trusting strong community of program operators, which is new to Fresno. From a school district perspective, it’s given me a much better sense and appreciation for what all educators bring to the table, no matter what agency they’re with, especially with the licensed home language providers. There’s an understanding here that no matter which agency you are from, we all share the responsibility for Fresno’s children to succeed. This group has valued cross-agency learning and demonstrated respect in a way that I haven’t seen anywhere else. Another piece that I think is innovative is that we’re testing and trying to figure out how to apply these strategies across multiple settings and agencies, across the continuum of learners from infants through 4 year olds. We differentiate what POLL strategies could look like for infants and toddlers. I don’t think there’s been a lot of work around how to support dual language learners from birth. Was there a moment that really brought the early childhood professionals together? Deanna: When the project began, we looked at the data, specifically around English language learners, and we knew that was an area all of us needed to engage in. Then Dr. Linda Espinosa, an expert on language development who created the POLL Strategies we use, came in to talk with us. Maria: There is a consistent increase of teacher comfort level using POLL strategies across all settings, from one-on-one time, to outdoor play, to math and science and activities. There is also an increase in comfort level supporting dual language children in the classroom or in the home. Teachers are encouraging parents and guardians to play with their kids, sing with their kids, to be involved with their children more. You see a different level of engagement from the families, especially our monolingual Spanish speaking parents. One of the teachers shared how she’s only English speaking, and she wanted to give items Spanish labels in the classroom, so she approached the parents and they were so supportive of representing their identity in the classroom. That’s just one example but overall, you see that the families volunteer to be in the classroom and they like to come and teach. One of the parents came and did a whole lesson on how to make tortilla, and she did it all in Spanish. Deanna: And it’s been really great to see steady educator attendance, on Saturday mornings five times a year no less, which I think is a success. Have you seen any transformations in the educators in their professional learning? Maria: Teachers are excited about showing what they have been able to accomplish. There has been that sense of release and also an opportunity for the teachers to recognize the importance of dual language learners, and what they bring to the table and also the strengths that the families bring into the classroom. In the beginning, in-home provider teachers didn’t feel that they belong in this professional setting. They would sit in the back. Now you see them, they see themselves and say, “I’m part of this community of teachers. I might be in the home but I’m a teacher.” For them to be able to recognize that was huge. Deanna: We’ve heard from licensed home providers: “We didn’t even realize that we were teachers. We’re teachers. We’re right here with you.” They’re not only building capacity within themselves but it’s changing the way they face their work. We also made a switch where each agency goes up and shows what they’ve tried in between sessions, and we’re doing cross-agency visits. They’re teaching each other. That’s been amazing to watch. Any transformations in the system? Deanna: I think there’s a much better understanding in our community about the multiple delivery service options. And we are truly all there learning together from the executive officer to the para-educators. If you value it, you’ll be right here with me, side by side learning. We can talk it with them. I think that’s important for any leader when you’re implementing something new. Maria: I think for the practitioner, they really see that and recognize that is rare. They’re not alone and that they know this is a learning process. Another shift is that we really think about how we align the project with the rest of our program within the school district. How are you thinking about scale? Deanna: We had people contacting us to join and we realized we really needed a decision making table—a coach support mechanism and a teacher support mechanism that all informed up into the executive table to make decisions. As a team, we felt that we needed to be able to inform the cradle in the Fresno’s cradle to career movement. To do this, we created an early childhood table. That includes the Department of Health, Department of Behavioral Health, Head Start, all of the Fresno Language Project participants and some other agencies. Then that’s also helped to design a Help Me Grow table, a leadership table where we can all discuss the results of developmental screenings and create a coordinated response. I think it’s kind of been the impetus and developed the soil for other leadership endeavors in early childhood. Deanna: We also brought in coaches from agencies to scale to more of the community. We knew we couldn’t keep adding participants, that our coach couldn’t be stretched that far, so we included the coaches from each agency. They’re there learning with us whether their sites that they coach are involved or not. The managers of each program are involved, so they’re scaling pieces like the Family Languages and Interest Survey. The Quality Rating and Improvement System (QRIS) team out of Fresno County Superintendent Schools are involved and the Fresno County Office of Education has embedded dual language learning into the local QRIS rating matrix. The K-12 English learner department at Fresno Unified and our early learning team are now working together not just on the Saturdays but actually in planning professional learning with some strategies embedded. That’s really important. This has been really inspiring. Thank you. Before we close, is there anything else you’d like to say? Deanna: I have the deepest gratitude for what all of the educators do. I definitely see that they all contribute to our success, to kids’ success, we all do. For me, that’s been huge. And I’ve always been supportive of dual language or bilingualism, but I have such a deep appreciation now for dual language learners and that language really is culture.